Original caption: “In New York’s Times Square a white-clad girl clutches her purse and skirt as an uninhibited sailor plants his lips squarely on hers”. Photo by Alfred Eisenstaedt. After four years of blackout, all the lights in Time Square went on as Mayor LaGuardia announced the Japanese surrender. In a celebration mirrored around the world, the New Yorkers took to the Square to celebrate a new era of peace, and hope, the image of which was captured on Alfred Eisenstaedt’s picture of an unknown couple kissing. 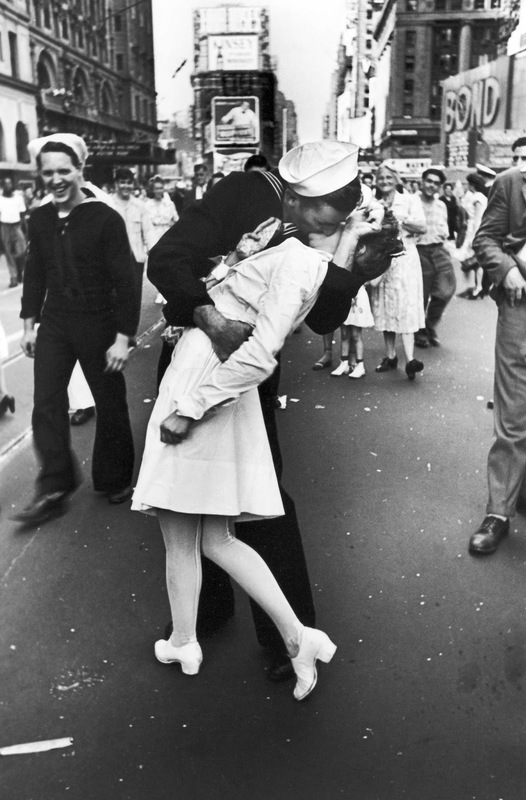 The picture portrays a U.S. Navy sailor grabbing and kissing a stranger—a woman in a white dress—on Victory over Japan Day (“V-J Day”) in New York City’s Times Square on August 14, 1945. The photograph was published a week later in Life magazine, among many photographs of celebrations around the United States that were presented in a twelve-page section titled “Victory Celebrations”. Soon It became a cultural icon. In two different books he wrote, Alfred Eisenstaedt gave two slightly different accounts of taking the photograph and of its nature. From Eisenstaedt on Eisenstaedt: “In Times Square on V.J. Day I saw a sailor running along the street grabbing any and every girl in sight. Whether she was a grandmother, stout, thin, old, didn’t make a difference. I was running ahead of him with my Leica looking back over my shoulder but none of the pictures that were possible pleased me. Then suddenly, in a flash, I saw something white being grabbed. I turned around and clicked the moment the sailor kissed the nurse. If she had been dressed in a dark dress I would never have taken the picture. If the sailor had worn a white uniform, the same. I took exactly four pictures. It was done within a few seconds. Only one is right, on account of the balance. In the others the emphasis is wrong — the sailor on the left side is either too small or too tall. People tell me that when I am in heaven they will remember this picture”. From The Eye of Eisenstaedt: “I was walking through the crowds on V-J Day, looking for pictures. I noticed a sailor coming my way. He was grabbing every female he could find and kissing them all — young girls and old ladies alike. Then I noticed the nurse, standing in that enormous crowd. I focused on her, and just as I’d hoped, the sailor came along, grabbed the nurse, and bent down to kiss her. Now if this girl hadn’t been a nurse, if she’d been dressed dark clothes, I wouldn’t have had a picture. The contrast between her white dress and the sailor’s dark uniform gives the photograph its extra impact”. U.S. Navy photo journalist Victor Jorgensen captured another view of the same scene, which was published in the New York Times the following day. Jorgensen titled his photograph Kissing the War Goodbye. Unlike the Eisenstaedt photograph, which is protected by copyright, this Navy photograph is in the public domain as it was produced by a federal government employee on official duty. 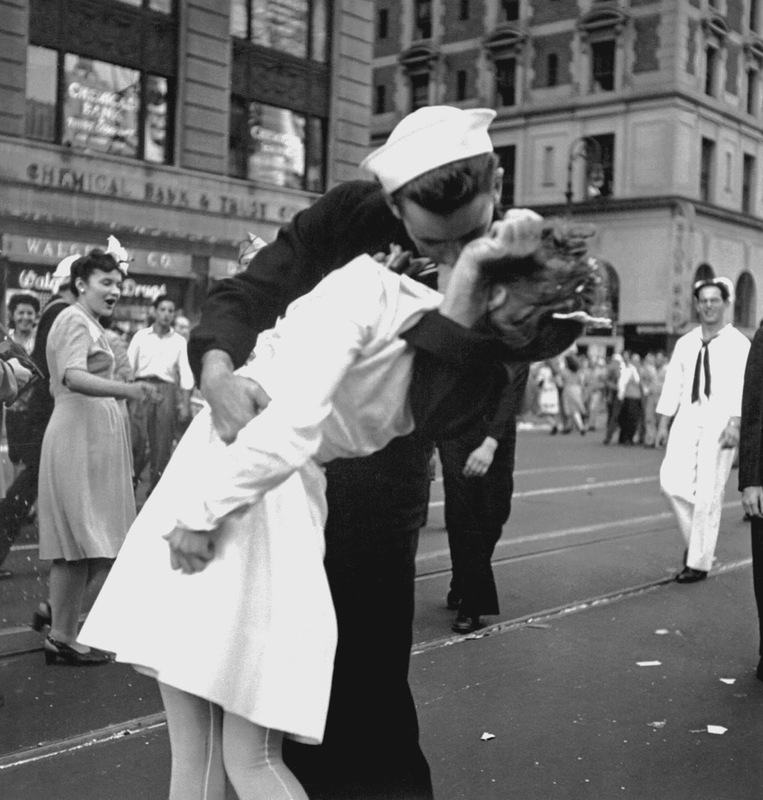 orgensen’s Navy photograph of the V J Day kiss in Times Square. Decades later the unknown couple was identified as the American sailor George Mendonsa and nurse Greta Zimmer Friedman. Greta Friedman was 21 years old on August 14, 1945. After reporting to work at a dentist’s office, she heard the news: Japan had surrendered, and World War II was coming to an end. She wandered into Times Square when a passing sailor locked her in an unexpected embrace. “I did not see him approaching, and before I know it I was in this vice grip,” she told CBS news in a 2012 interview. “It wasn’t my choice to be kissed. The guy just came over and grabbed. That man was very strong. I wasn’t kissing him. He was kissing me”. The kisser was the 22-year-old George Mendonsa of Newport, Rhode Island. He was on leave from the USS The Sullivans (DD-537) and was watching a movie with his future wife, Rita, at Radio City Music Hall when the doors opened and people started screaming the war was over. George and Rita joined the partying on the street, but when they could not get into the packed bars decided to walk down the street. It was then that George saw a woman in a white dress walk by and took her into his arms and kissed her, “I had quite a few drinks that day and I considered her one of the troops—she was a nurse”. Friedman died at age 92 on September 8, 2016, in Richmond, Virginia. She is buried beside her husband, infantryman Mischa Elliott Friedman, at Arlington National Cemetery. A personal friend of mine happened to be in here on that day. She was still a teenager and she tells that several soldiers tried to kiss her, but her mother wouldn't allow that to happen.